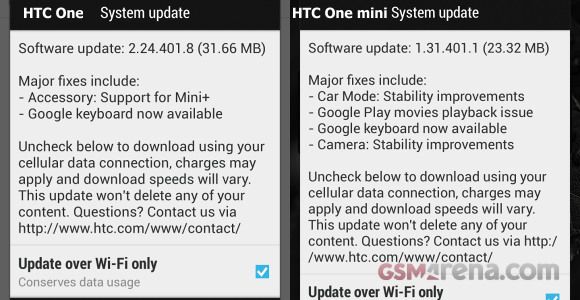 Today HTC launched small firmware updates on the HTC One and HTC One mini smartphones. HTC One's OTA update weighs about 32MB and brings Google Keyboard and support for the Mini+ accessory. HTC One mini got even better treatment. Besides the availability of Google Keyboard, the new firmware also improves stability in the camera and car mode, plus it fixes a movie playback issue with Google Play. HTC One mini OTA update is 23MB. Both updates are already seeding to One and One mini droids. In case you didn't get the notification just yet, it is either coming to you any moment now or you just need to check for an update manually. Don't know how it arrived in India weeks ago, been checking it for a while now! Any updates from other Indians?? Hi I have not received any updates here in Singapore. When I go to apps to download Google keyboard it says not available in your country.